There a good deal of talk right now of an impending emerging markets crisis. The idea is simple: we have lived for the past several years in a world awash with dollar liquidity, and with the Fed looking to start “tapering,” investors are no longer so eager to splash around in emerging economies. That could spell crisis if investors rush out of those economies en masse. Indonesia is one of those economies considered most vulnerable to such a crisis. And looking at the Rupiah/US Dollar exchange rate since the beginning of the year, the decline in the rupiah seems obvious and quite worrying. But for every voice warning of crisis, there is a skeptic. Analysts like Marco Annunziata are offering some reassurance about the implications of India’s tough summer. Paul Krugman is perhaps among the most prominent of skeptics, focusing on Indonesia and observing that its debt is nowhere near as high as it during previous bouts of financial crisis. In the case of Indonesia, I am a skeptic too, but for rather different reasons. Look at the historical context. We’ve seen an honest-to-goodness financial crisis in Indonesia in recent memory, and the scale of the rupiah’s recent decline is nothing compared to the events of 1997-98. The point here is not to show that the recent rupiah depreciation is no big deal. After all, the big sell-off could just be around the corner, as it was in June 1997. 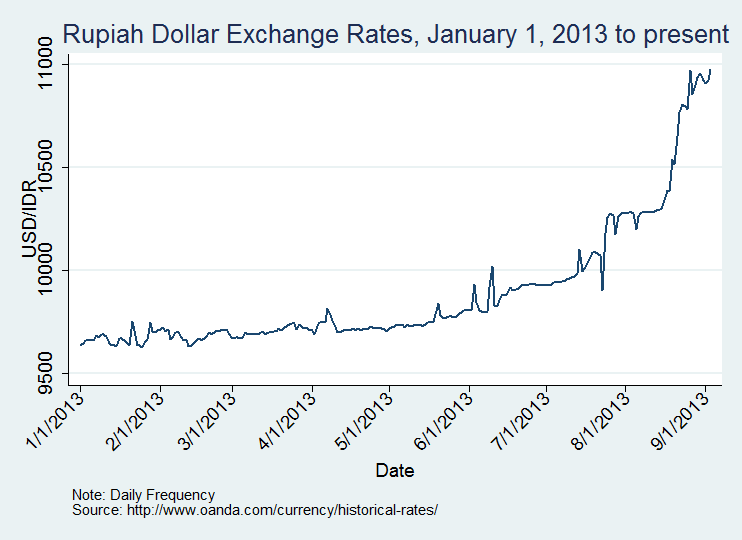 Rather, it’s to illustrate the path of the IDR/USD rate in the years prior to each moment of financical uncertainty. 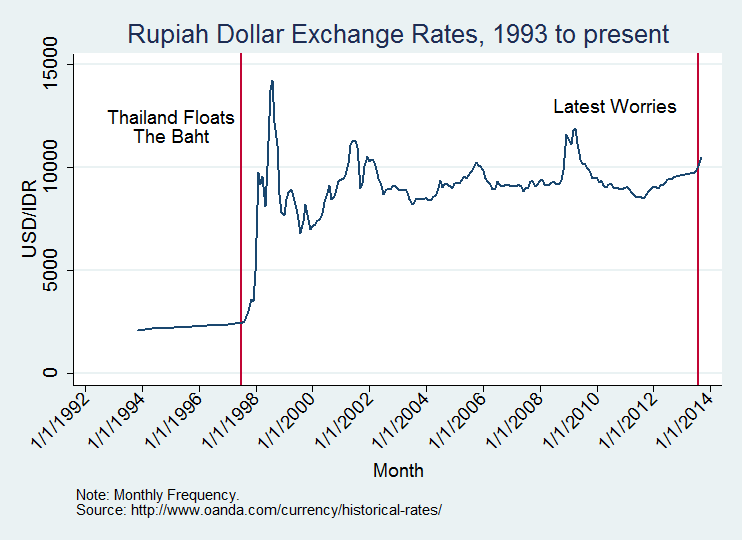 For most the 1990s, Indonesia’s exchange rate was a crawling peg that kept the rupiah on a steady and predictable rate of nominal depreciation vis-a-vis the dollar (technically, a basket of currencies, but the dollar took up about 99% of the basket). Investors abroad and at home came to believe that that crawling peg represented some form of a commitment to that nominal exchange rate path. As I describe in my 2009 book, Economic Crises and the Breakdown of Authoritarian Regimes, Indonesian borrowers borrowed in dollars, but made money in rupiah. Because they believed the exchange rate to be credible, they tended not to hedge their debts against currency volatility. This currency mismatch—a frequent but not necessary consequence of original sin—was at the root of Indonesia’s crisis in the 1997-98. Indonesia was forced to float the rupiah in summer 1997, and since then it has more or less remained freely floating vis-a-vis its major trading partners. What does that mean? First, you can see that the nominal IDR/USD exchange rate has been much more volatile since 2000 (after some semblance of stability had been achieved). The coefficient of variation (ratio of S.D. to Mean) for monthly exchange rates over the recent period is almost twice that of the mid-1990s. Second, investors act accordingly. Hedging is now common, because investors do not believe that authorities will automatically support the rupiah. Accordingly, not only is Indonesia’s debt now much lower than it was in the 1990s (Krugman’s point), but also debt provision and credit creation are much less sensitive to rupiah depreciation than they were in the 1990s, because banks and firms should not need to hoard rupiah to cover their rupiah losses over the short term. Depreciation is now a symptom of investor sentiments rather than an independent cause of macro vulnerability. That should protect the Indonesian economy. Beyond the response of investors to greater rupiah volatility, the policymaking team in Jakarta is more sensitive to the vagaries of international markets today than their predecessors were in the 1990s. Questions of the Indonesian economy’s resilience in a volatile global financial market are something of an obsession in Bank Indonesia and the Ministry of Finance. Macro policymaking has been not just responsive, but proactive: over a year ago, for example, the policy team in Bank Indonesia began to ease rules on hedging as a prospective measure to facilitate self-insurance against rupiah depreciation. I also happen to know (casually) Indonesia’s current Minister of Finance, M. Chatib Basri. In fact, I met him most recently during a conference on how Asia was coping with the Global Economic Crisis, where he presented a very good paper on Indonesia’s experiences with the GEC and the Asian Financial Crisis (PDF here). I conclude from that experience that there is a healthy awareness of the dangers of volatile global capital markets. Combined with the Indonesia’s new political environment—Indonesia is a no longer a dictatorship—I expect that this team will be better placed to make difficult decisions than its predecessors were under the close watch of Soeharto and his cronies. That said, there may be other reasons to worry. As I recently argued in a paper comparing several Southeast Asian economies between 1997 and 2008, there are many reasons to doubt about the sustainability of Indonesia’s current political economic model. Most troubling in the context of this crisis, sometimes the cronies still get their way. The best example in recent years is Aburizal Bakrie pushing out former Minister of Finance Sri Mulyani Indrawati because she refused to break Jakarta Stock Exchange rules to protect the shares of one of his companies. But all of that is different than the question at hand, and we should not conclude that the Fed’s taper will generate a full-blown crisis in Indonesia. Instead, it will probably generate a difficult macro policymaking environment in which the terms of the Mundell-Fleming trilemma will be very clear. Only by tightening monetary policy will Indonesia be able to defend the rupiah. Tightening monetary policy will cool off the Indonesian economy. And elections are due in 2014. So while I suspect that Indonesian policymakers are living in interesting times, and the Indonesian economy is set to hit some bumps in the road, it is probably going to avoid a full-blown financial meltdown. Hi Tom – couldn’t agree more. It seems to me that the argument in Michael Pettis’s The Volatility Machine is a useful framework for understanding why Indonesia should be able to weather tapering: because of the changes you outline above (expectations, hedging, reserves, etc.) Indonesia no longer has the negative feedback loops that would exaggerate the effect of capital withdrawal / reduced inflows. I think it’ll be interesting to see how dysfunctional Indonesia politics becomes as both natural resource revenues decline and capital flows decline — I see the Bakrie-Sri Mulyani conflict as well as the bout of protectionist policies designed to allow certain parties/politicians to capture rents to fund their party machines as possibly a sign of things to come. Glad you agree, Sam! And it sounds like I better give in and have a close read of The Volatility machine, which I’d heard of before but never actually read.